To make CHEESE SAUCE: With a grater, shred cheese. Place into a blender. In a small sauce pot, bring cream and milk to a boil. Turn blender on and slowly incorporate warm cream into the cheese. Switch to high speed and blend until smooth. Strain sauce. To make SANDWICH: With a bread knife, cut amoroso roll in half; toast. On a griddle, melt butter, then sauté peppers and onions until soft. Place frank on griddle, butterfly side down, and cook until heated. 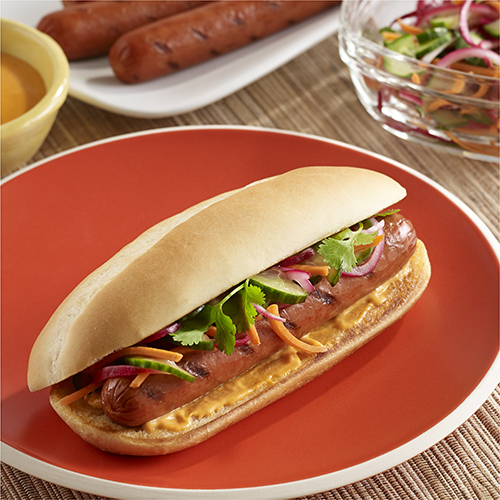 Place the frank onto the roll, top with peppers and onion, then smother with Cheddar Cheese Sauce. Plate and serve.